scientists, representatives from funding agencies, publishers, editors, postdocs, and Nobel laureates) came together for ASAPBio (asapbio.org), a meeting to discuss the role of preprints in communicating research in biology. Because this topic concerns the whole scientific community, the meeting was video recorded and live streamed, and opportunities for feedback were available to both virtual and physical participants. Preprints are versions of research manuscripts posted online (to a server like bioRxiv or PeerJ Preprints) that have not yet undergone traditional peer review. 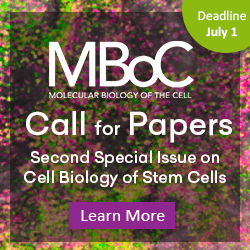 Their use could dramatically speed up communication within the biology community, and they could be used as interim evidence of productivity on fellowship applications—something particularly important for early-career researchers, given how long it takes to get manuscripts published. However, few biologists are using preprints right now, likely because they aren’t familiar with them and also because there are several barriers to their use. For example, some journals do not accept work that has previously appeared as a preprint (you can check this list of journal preprint policies on Wikipedia: http://bit.ly/1iBJW4L). Furthermore, some researchers are concerned that their colleagues would not read and cite preprints, leaving them vulnerable to being scooped. And finally, some funding agencies seem to allow only accepted or published manuscripts to be listed as research publications. However, most scientists who participated in an informal survey conducted on ASAPbio.org prior to the meeting would like to see these barriers removed. Our Twitter hashtag, #ASAPbio, was heavily used by attendees with a certain progressive perspective, leading to some inadvertent confusion about the goals of the meeting. Therefore, to clarify, the goal of ASAPbio is NOT to mandate the use of preprints, to disrupt journals, or to eschew peer review. Rather, ASAPbio aims to remove barriers to the use of preprints in biology. We invited many parties interested in scholarly communication, running the gamut from traditional journals to vocal advocates for revamping the publishing system. Our task was to find some common ground among them. We can all agree that preprints can greatly speed the pace of scientific progress. Best of all, their adoption is immediately feasible because they’re compatible with our current system of disseminating science. In fact, the physics community has been using preprints in harmony with journals for decades. No one could attest to this better than our keynote speaker, Paul Ginsparg, the founder of arXiv (arXiv.org). With his flight from Ithaca cancelled due to snow, Ginsparg joined us by video conference as a giant talking head that dispelled myths about arXiv. (For example, he explained that not all subfields of physics adopted it at the same time, over 80% of arXiv preprints eventually appear in a journal, and not all physicists work in 1,000-member consortia.) He also educated us with statistics on its operation and cracked innumerable burning jokes (it’s worth watching the keynote at asapbio.org/video-stream for those alone). The major takeaway from his talk was that preprints have worked effectively in the physics community, which is actually not so different from the biology community after all. During the meeting, we asked participants (in person and online) for written feedback on three draft declarations. They covered: 1) how we as scientists can disclose and acknowledge research with preprints; 2) a clarification of editorial policies about preprints, written by representatives from journals; and 3) how those responsible for hiring and promotion can use preprints to evaluate candidates. We asked participants whether they would endorse these documents, and to our surprise, over 90% of the respondents answered “yes” or “yes, but consider changes.” Most of the “no” responses came from those who are barred from making endorsements by their professional role. Bolstered by this feedback (asapbio.org/drafts), we’re now using the comments suggested by the participants to move toward final versions of these declarations to be posted online for public endorsement. Survey results from ASAPbio.org (392 responses). Full survey results can be found here. To borrow a term from a commentary by Bernd Pulverer from EMBO Press, preprints and journals can exist in symbiosis.1Many attendees were in favor of the logic of separating the disclosure of an article (with a preprint) from its evaluation (with the traditional editorial process), a concept elucidated in a commentary by Ron Vale and Tony Hyman.2 Therefore, in the words of Jamie Fraser, you don’t need to choose between preprints and journals. You can have both! The topic of two of the morning’s breakout sessions was how funding agencies can benefit from preprints. In the reports of those discussions, we heard that many funding agency representatives were excited about the potential for preprints to act as more accessible indicators of scientific progress. This is especially true for evaluating early-career researchers who have not had time to build a large body of published work. Several representatives discussed specific policy changes that they hoped to implement, especially changing language to explicitly encourage applicants to feel free to list preprints. 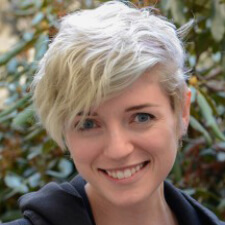 For example, during his five-minute talk, Phil Bourne (NIH Associate Director for Data Science) reported that that the NIH is ready to reexamine its policies on preprints, and during the closing discussion Maria Leptin (Director of EMBO) was enthusiastic about using preprints for fellowship applications. The ASAPbio team is now devising a one-year plan so that we can act strategically to achieve specific goals. First, we’ll continue working with journals and funding agencies toward statements clarifying their preprint policies. We’ll look to markers of changing attitudes in the community—for example, statistics on the usage of preprints, signatures on the declarations we’re drafting, and innumerable other actions that individual scientists can take. Daniel Mietchen pointed out that February 29 is leap day, and suggested we use that opportunity to take a leap forward for preprints, concentrating efforts to take the actions above on that day. If you embraced preprints in any of these (or other!) 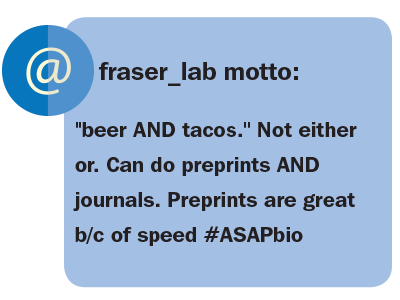 ways, before, on, or after February 29, let us know by tweeting with #ASAPbio! The author was one of the organizers of the ASAPBio meeting, together with Daniel Colón Ramos (Yale), Ron Vale (University of California, San Francisco), and Harold Varmus (Weill Cornell Medical College). She thanks COMPASS members Pinar Gurel and Gary McDowell, who provided invaluable feedback both on this blog post and as attendees of ASAPbio. 1Pulverer B (Feb 8, 2016). Sharing preprints and publishing papers: a symbiosis. ASAPBio. 2Vale R, Hyman A (Feb 10, 2016). What defines “priority of discovery” in the life sciences? ASAPBio.